Duff here. I’m a Big One on Color. 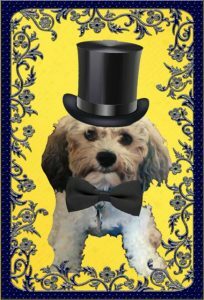 I am a Bichy-Poo-Shi-Tzu, a Bichon Frise-Toy Poodle-Shi Tzu mix. In other words? A pedigreed Mutt. My paperwork from the Veterinarian’s office notes that I am Tri Color. Hmmm . . . I have a Cinnamon Brown head, with Brownish Ears. The primary color of my face is White, with Brown streaks. My body? Mostly white, with Brown spots. The largest marking is a Brown Spot on My tail End, which almost looks as If I sat in Something. Top it all off with a Fluffy White tail and You have one Handsome Dude. That’s Me! Living unstuck. What Colors can I see? Contrary to popular Myths, I see so Much More than Black and White. Did You know: We Canines favor yellows and Blues. That bright Red Eye catching Toy? Looks muddy brown to me. But a Bright daffodil colored Yellow tennis Ball? I’m all over it! Now that’s living unstuck.